I might have a problem. I collect amiibo, the little (and occasionally huge) figures that Nintendo makes of all their characters that interact with your games. But I collect way too many of them. 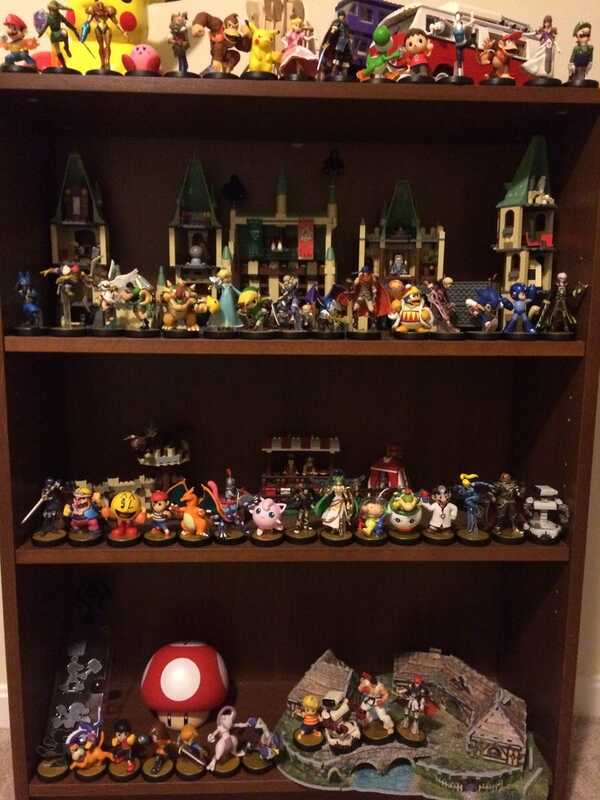 I have every Super Smash Bros. and The Legend of Zelda amiibo to date, and many more from various other series. I’ve already pre-ordered all of the Champion and Odyssey amiibo, and have a super-secret plan to get all of the Zelda amiibo two days from now even though I’ll be flying for a significant part of the day. It’s bad. Imagine if amiibo were DLC. You pay $16 for all of the functionality that amiibo provide today, but no figure. All you get is what the amiibo gets you in-game. Sure, you can use it across many different types of games, but chances are that not one of those uses is compelling enough to justify its purchase. No one would buy them! Sure, maybe enthusiasts would buy some to play more levels of Splatoon or for the novelty of training their characters in Super Smash Bros., but they wouldn’t be near the craze that they are today. Unless I am very much mistaken, amiibo seem to be among the healthiest of the toys-to-life. Disney Infinity is already out despite having access to some of the most popular IPs in the world, Skylanders is skipping 2017 for any new games, and while Lego Dimensions is doing quite well, TT Games has stated that they plan to support it with new figures for only three years, while amiibo will most likely continue production until the inevitable heat-death of the universe. There’s also the recently announced Starlink: Battle for Atlas where you apparently attach a spaceship to your actual controller, but time will tell how that game sells come Fall 2018. I own most of these. And the crazy thing is that the reason amiibo are at, or very close to, the peak of toys-to-life is that they’re really not toys-to-life at all! With some exceptions, they act more as keys to content within games rather than characters that you tap on your portal, controller, etc. to play as those characters, the way that most other toys-to-life follow. This leads to much less compelling uses of the amiibo, yet allows Nintendo to extend amiibo’s relevance indefinitely by adding new amiibo and functionality periodically with most new games on 3DS and Switch that they put out without having to develop one core game or series that exclusively supports the figures, as do all other toys-to-life models. But none of this really matters, because we all know why amiibo sell: Intellectual Properties. Sure, Disney Infinity might have arguably had more popular IPs, but a large audience of those IPs had no interest in video games. The Incredibles are popular, to be sure, but only a fraction of fans of the movie are also gamers. The same problem arises for Lego Dimensions. With the exception of Sonic, most of the in-game characters and worlds from Doctor Who, Scooby-Doo and Harry Potter are IPs that got their start outside of gaming, and thus Dimensions depends on the crossover of fans of its IPs as well as fans of gaming. It is true that these games tend to appeal to younger and less experienced players, but they still require a dedicated video game system that non-gamers probably don’t own. Mario and Zelda might not be quite as popular as Star Wars and Harry Potter, but they have the advantage of having a fanbase consisting of 100% gamers, (Unless you’re just a fan of The Legend of Zelda for the 80s cartoon) and Nintendo still owns some of the best IPs in all of gaming. Oh, and there are a lot of IPs that Nintendo owns. At their core, the mass appeal for amiibo doesn’t stem from their functionality in-game that is also a cool figure as a bonus. For most people, amiibo serve primarily as cool figures that also give neat little bonuses in-game. Are we being ripped off? Maybe. Are we going to stop collecting them? Hell no!